Tape or stick two pages of the chart paper on the wall, one above the other so that they make one long sheet. The highest point of the top piece should be higher than any of your students can jump, and the bottom of the lower sheet should be no higher than your shortest student’s head. If you need a third sheet of paper to cover this range, you can of course use it. Alternatively, you can have students try a standing long jump, instead of jumping up. This requires no chart paper, but would work best with a roll of masking tape and a measuring tape for each team. NOTE: If you create only one jumping station, children will have to take turns, which might take some time. Plan for this, and think about what children can do as they wait for other children to jump. You might also consider creating two or three jumping stations in order to speed up the process, though this may require multiple staff, particularly if your children are younger. If you have the prep time, you can place a long piece of tape alongside the paper and label it with inches or centimeters, from the floor to the top of the chart paper. This will help you quickly determine how high each student jumped in this activity, rather than having to measure after each jump. Ask if anyone knows if the effect of gravity on the Moon is the same, stronger, or weaker than it is on Earth. After a few guesses, if you can, show them this NASA video of an astronaut jumping on the Moon (click here) and then have them guess again. After a few guesses (or, if you couldn’t show the video), tell them that the Moon’s gravity is weaker than the Earth’s – in fact it is 1/6th as strong as on Earth. When you’re on the Moon, you are 1/6th as heavy, but your muscles are as strong as they are on Earth, so you can jump 6 times farther. See how high you can jump, and then calculate how high that jump would be on the Moon! There are two versions of this activity, high jump and long jump. If you have time, try both! Each child who wishes to try should get a turn to jump. 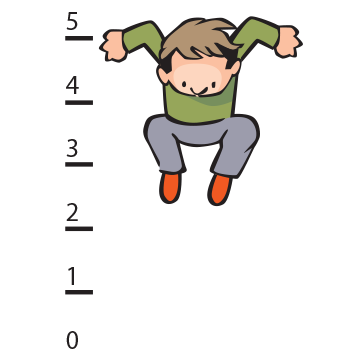 For students who have difficulty jumping, you can challenge them to throw a ball or beanbag as far as they can, and measure that distance instead. Stand facing the chart paper on the wall, holding a marker. Reach your hand over your head, as high as you can, and make a mark on the paper with the marker. This is your starting point. Take a small step back (no running starts! ), bend your knees and jump as high as you can, making a mark on the paper with your marker at the highest point. Measure the distance between your starting mark and your jumping mark. This is how high you jumped. Write down your measurement. After every child who wants to try has had a turn to jump, have your students calculate how high their jump would have been on the Moon by multiplying their measurement by 6. For older children, encourage them to do the math on paper. For younger children who have not yet learned how to multiply, you can use a calculator. The resulting Moon jump measurement is how high their feet would be off the ground if they had jumped on the Moon. You can have each child record this height on the paper on the wall, measuring this time from the floor to their Moon jump measurement. Each child who wishes to try should get a turn to jump. For students who have difficulty jumping, you can challenge them to throw a ball or beanbag as far as they can, and measure that distance instead; or challenge a child in a wheelchair to see how far they can propel their chair with one big push. Make a mark on the floor with a piece of tape. This is your starting line. Jumpers should stand with their toes touching this mark. When you are ready, and without taking a running start, bend your knees and jump as far forward as you can from a standing position. One member of the team should be in charge of noting where your toes landed. Another member of the team can place a piece of tape there and write your name on that piece of tape. Measure the distance from the starting line to your jump, and record that number somewhere. After every child who wants to try has had a turn to jump, have your students calculate how far their jump would have been on the Moon by multiplying their measurement by 6. For older children, encourage them to do the math on paper. For younger children who have not yet learned how to multiply, you can use a calculator. You can have each child record their distance in some central location so you can see the whole group’s results. Ask your students if they were surprised by the results. Could anyone jump over their own head on the Moon, or farther than their own height? Who jumped the highest/farthest? What do they think it would be like to walk on the Moon? What would it be like to play basketball, soccer, or another sport? Reinforce the idea that the reason they can jump higher or farther on the Moon is because gravity is weaker there; and the reason that they can jump less high or far on Earth is because gravity is stronger. If your students would like to, they can try again. You can also try the standing long jump, if you already did the high jump, and the high jump if you already did the long jump. Visit NASA’s solar system site at http://solarsystem.nasa.gov/planets for amazing images and information on each of these planets and moons, which you can share with your students. If you try the extension activity in the Make it Better section, calculating the jumps on different planets and moons, you could print out or show children images of these bodies, using images included in this curriculum (see NASA Inspirations pdf for Solar System images), or by visiting https://www.nasa.gov/.